Vials of the injectable steroid made by New England Compounding Center implicated in a fungal meningitis outbreak. About 17,700 single-dose vials of the steroid sent to 23 states have been recalled. Federal health officials had good news Wednesday for some of the people injected with fungus-contaminated steroids: They don’t have an open-ended wait to find out if they are infected. The greatest risk for fungal meningitis comes in the first six weeks -- 42 days -- after injection, the Centers for Disease Control and Prevention says. After that, doctors and patients still need to watch but they may not need to worry quite as much, the CDC said in updated guidance. "This is the light at the end of the tunnel," Dr. John Dreyzehner, the commissioner of the Tennessee Department of Health, said at a press conference Wednesday about the new guidelines. "By Nov. 8, patients exposed in Tennessee will have passed the 42-day mark." In Tennessee, 70 patients have been sickened and nine died -- the most in the nation -- after receiving tainted steroid injections. The outbreak of fungal disease has made 308 people sick in 17 states so far, and 23 of them have died, the CDC says. 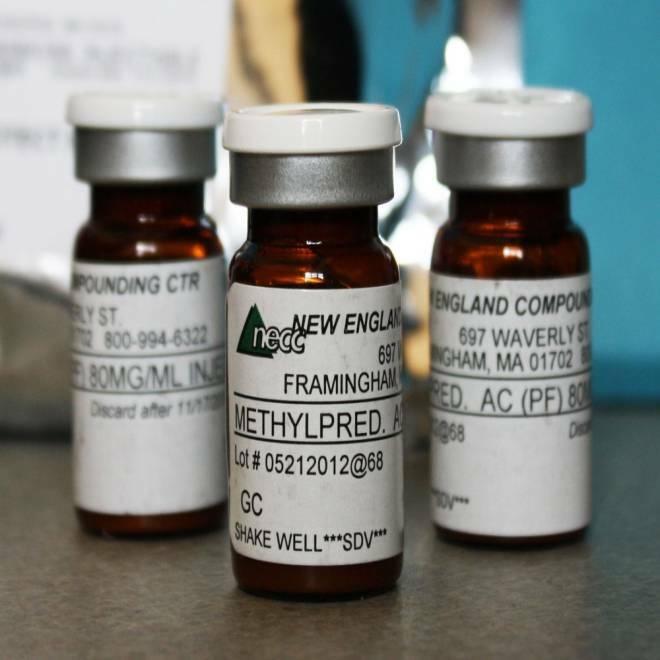 The New England Compounding Center in Framingham, Mass., the pharmacy that distributed the contaminated steroids, has been closed and its license has been permanently revoked. State officials say they have found dirty conditions there. As many as 14,000 people may have received injections from three batches of steroid from the plant, the CDC says. Those not already sick are waiting and worrying that every headache might mean they have meningitis, an inflammation of the protective membranes of the brain and spinal cord. The contaminated steroids were shipped to 76 pain clinics nationwide. CDC officials said the potentially tainted shots were first given May 21. Patients are monitoring themselves for symptoms including headache, fever, nausea, stiff neck and sensitivity to bright light. Patients who received injections and are concerned should contact their doctors, officials say. Doctors must then decide whether to give a spinal tap to test the spinal fluid, a procedure that itself can cause headache and other side-effects. CDC still says no one should get antifungal drugs unless they show some signs of infection. “CDC does not recommend initiation of antifungal treatment in the absence of diagnostic test results indicating fungal meningitis in exposed patients who are asymptomatic,” the agency says. Patients will likely have to undergo months of treatment with two antifungal drugs, voriconazole and amphotericin B. “Adequate duration of antifungal treatment is unknown, but patients likely will require prolonged therapy tailored by the clinical response to treatment,” CDC said. Most of the patients have been infected with a black mold called Exserohilum. It rarely infects people and only a few drugs can get to it, notably voriconazole. “Antifungal treatment with voriconazole carries significant risk of hallucinations and other neurologic side effects, and liver damage. CDC recommends careful discussion of risks and benefits between physicians and their patients,” CDC said. Doctors should check up on all patients who got any injectable drug made by NECC since May 21, the Food and Drug Administration says. CDC notes that it has been at least 26 days since anyone got a contaminated injection. People have an 8 percent risk of infection at that point and the risk goes down to just over 1 percent after 42 days. Most of the people who have died from the fungal infections suffered strokes, and most got sick quickly after being injected. The lots of tainted drugs were recalled on Sept. 26, so patients should be in the clear by Election Day, Nov. 6, according to the CDC's math. CDC says 47 patients have laboratory-confirmed fungal meningitis. “This form of fungal meningitis is not contagious,” the agency says. All have Exserohilum except for one who had an infection with Aspergillus, another mold, and one with a fungus called Cladosporium. “These fungi are common in the environment but rarely cause meningitis,” CDC says. Investigators at the Massachusetts pharmacy linked to the meningitis outbreak say they found visible fungus, standing water and other unsanitary conditions at the facility.